For the third annual 199c show, put on by BLDG Refuge, they sent out baseball cards of former Reds players to serve as inspiration for the work submitted to this year’s show. I received Dave Parker’s card. I’ll keep this short. His nickname is “The Cobra.” After some doodling, I started to connect the shape of the Cobra head with that of a baseball’s panels. 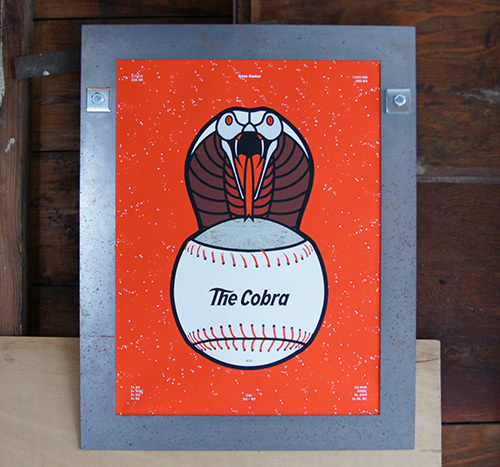 One thing led to another and I ended up with an unravelling baseball morphing into a Cobra. Taking inspiration from the oxidized steel frame I used, I added the matching texture to the print, and the rest is history. If you’re in the Cincinnati area April 2nd, come on by! 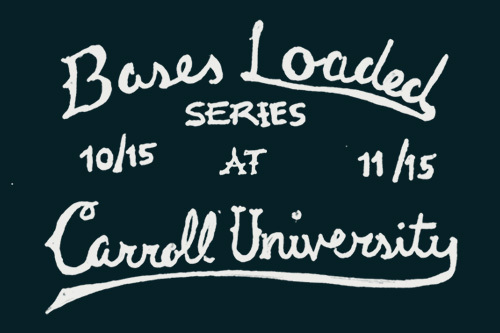 It’s been a great year for the Bases Loaded Series, and it continues this Wednesday, October 28 2015, at Carroll University. The series will be up October 26 – November 25 in the Joyce Paddock Bliss gallery, with the opening October 28 at 4:30pm. I’m really looking forward to visiting the university and working with the students via a portfolio review and design discussion. If you’re in the area, I’m giving away free high-fives! Super honored and excited to be invited back to 199c, the baseball art show from the radical people of BLDG in Covington, KY/Cincinnati, OH. This year is the “All Star Edition” and the Bases Loaded will be representing with 5 banners, including: “Mr. Cub”, “Jackie”, “Iron Horse”, “The Code” and “First Pitch”. From what I hear the festivities in Cincinnati for Opening Day / Opening Week are second-to-none. I’ll be making the drive down for the show opening, and I hope to see you there. BLDG proudly announces 199C: the region’s only Opening Day art event, April 3 – May 2. The show will feature artwork from 50+ artists from Covington and Cincinnati to Seattle and New York and major cities in between. 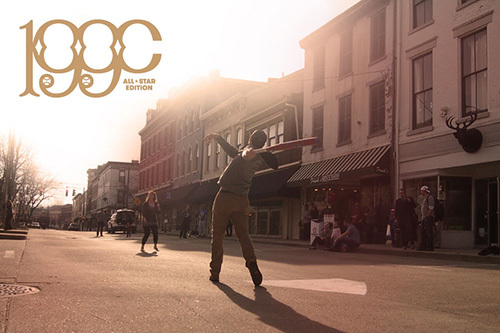 Celebrating and representing our favorite team and Opening Day, 199C draws its name from the Pantone color for the Reds. In honor of our hometown hosting the 2015 All Star Game this summer, BLDG upped the ante this year by assembling an “All Star” team of talent to participate in the show. Covington and Cincinnati-based designers such as Rob Warnick and Brian Stuparyk of Steam Whistle Letterpress were hand-picked to represent the home team, while nationally recognized greats like Jon Contino (New York, NY) and Brian Lindstrom (Madison, WI) form the away lineup, drawing inspiration from their favorite MLB team. The show kicks off on April 3 at the BLDG Gallery beginning at 4 pm and running through 11 pm. For full details, read the press releaseand follow the Facebook event. It was a great success up at the Sports & Society Conference for the Bases Loaded Series. Couldn’t ask for more. Great crowd, fun conversations and awesome people. 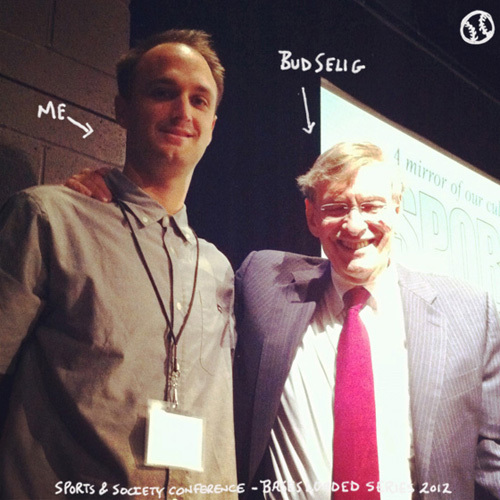 Plus got to hear Commissioner Bud Selig talk and hear some great baseball stories. It’s funny where design (or any other life path) will take you. I would have never guessed. BASES LOADED SERIES HAS LAUNCHED! 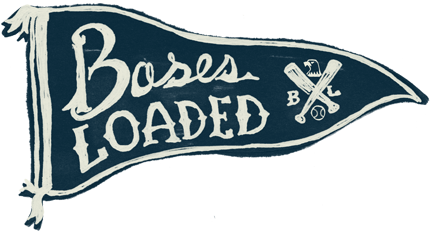 The Bases Loaded Series website has gone live today. It’s been a few months in the making, but all 18 banners are designed and finished. I’m in the process of screenprinting the banners now. They measure 26″x40″ 2 color on wool felt with a 1″ felt border. The first exhibition of the banners will be from November 25 – December 1 at the University of Wisconsin, Madison. To learn more about the series and take a peek or to inquire about hosting the exhibition, head on over to www.BasesLoadedSeries.com. The Bases Loaded Series is an exploration of conceptual graphic design and storytelling using American Baseball as the vehicle. The concepts are driven home with the relationship of text and image, and the process is 100% hand-done. The work in this series tackles issues that have been pivotal to the game of baseball and reflective of our American society. © Copyright 2019. Powered by NEWBARIC DESIGN Co..